How to work with HMRC to secure your R&D tax credit. Submitting an R&D tax credit claim could be the first big interaction many new companies will have with HMRC. It can be daunting, and therefore tempting for you to claim very little or put off claiming altogether. Don’t! In this article we explain simple ways to claim. Many companies are missing out on cash that should be rightfully theirs and are unaware of how the claim submission process works. Even worse, we’ve come across companies that have submitted claims which contain errors or mistakes due to a simple misunderstanding of the legislation. Unfortunately, this causes issues with HMRC or weakens a company’s negotiating position during due diligence for funds or sale of the business. The R&D tax credit scheme is designed to reward businesses for incurring expenditure developing technology solutions or innovative products. Most start-ups are looking to be disruptive in the market place either through their technology offering or the products they are offering. This means R&D tax credits are particularly important to this sector and can help with cash flow in the early years. The tax relief for SMEs now stands at 230% of qualifying costs. If your company makes a loss, you can choose to surrender the loss generated by the tax relief claim in exchange for a repayable tax credit that equates to 33% of the qualifying costs. As you can see this is a very generous scheme that is a key component within the UK Government’s Industrial Strategy. Claims can be made for expenditure incurred in the last two financial years, as well as qualifying expenditure incurred prior to trading. Also, if your business is a first time claimant you can apply for Advanced Assurance. This means that for the first three accounting periods of claiming R&D tax credits, HMRC will allow the claim without further enquiries. This assurance can be beneficial in attracting investors to your business. How can claims benefit ongoing growth? Buzzacott has worked with a medical sciences start up business who made a successful claim and reinvested the cash credit into the work seeking to obtain regulatory approval for their product. Likewise a technology start up reinvested their R&D credit in recruiting an extra developer to speed up the development of an interface to offer their product directly from a social media platform. In order for a project to qualify, it must seek to achieve an ‘advance in science or technology’ resulting in a new or appreciably improved product, process or device. This must be achieved through the resolution of ‘technological uncertainty’. Your report should explain why the eligible projects being claimed meet these criteria. As highlighted on the HMRC website, submitting a “project outside the scope of R&D for tax purposes being included in the claim” is a common error. You should aim for your report to explain as simply and succinctly as possible why the projects are eligible. 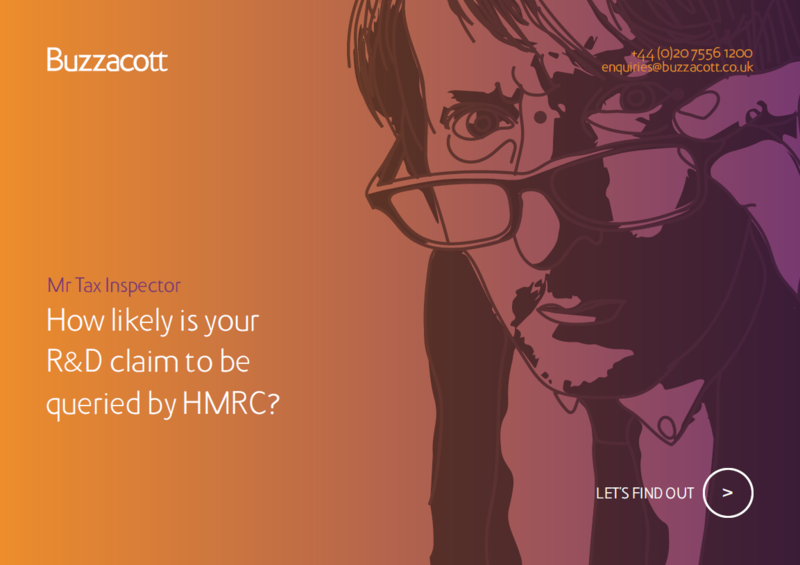 This will assist the HMRC Inspector in agreeing the claim promptly. How can you get your R&D claim agreed by HMRC? A successful claim needs full engagement from your finance and technical teams. Buzzacott's R&D team includes experts with backgrounds in high technology product development. Using our deep technical expertise we can discuss the work undertaken within your technical team and help them identify any eligible projects. Next we can create the documentation that explains the eligible projects in the right way to show HMRC that they meet the qualifying criteria to be included in an R&D claim. Would your technical team benefit from this type of help and guidance in preparing your claim? Our tax specialists can work with your finance time to extract the right costs to be claimed. Again HMRC list a number of areas where they see common errors in R&D claims. We can make sure that your claim is free of any errors that could result in an enquiry and ultimately penalties being imposed by HMRC. Would you really want to begin your HMRC working relationship in such a negative manner? We can prepare the full R&D claim for your business and minimise any disruption to the operation of your business. Otherwise we can provide support through the claim process where you feel you need help. Whatever way we help you we do not hide our workings from you and we pride ourselves in helping clients embed the claim process for future claim. Our best advice to you is do not settle for an advisor that does not share the claim details with you. What can you do if things have already gone wrong? Our experience is that HMRC Inspectors are reasonable and issues occur when the claimant and the Inspector are misunderstanding each other. The key to successfully resolving an HMRC query or enquiry is to remove any misunderstanding between the two sides. Our technical expertise can assist your technical specialists in understanding exactly what is concerning the Inspector. If your company is a software development, manufacturing, engineering, hi-tech or any other technology-based company, it is likely that you will be incurring qualifying R&D expenditure. Our R&D credits team can help you identify whether the work your business is undertaking might qualify for R&D credits. We're happy to have a quick chat to help you determine whether a claim can be made, or whether your existing claim is picking up all potentially qualifying projects. If your company is already claiming we can offer a free claim check to look for issues that might be picked up by HMRC or during due diligence. VAT 1 Technology advice and support 2 R&D tax credits for architects – what should you know?